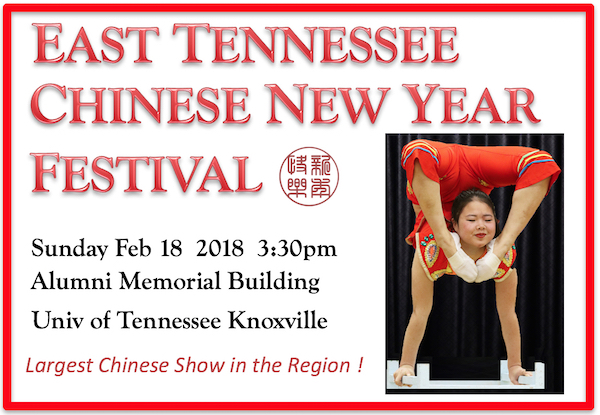 Come celebrate the start of the Year of the Dog in grand style at the 2018 East Tennessee Chinese New Year Festival! This variety show will feature dancing, singing, music, martial arts, and more. Special Guests "The Fabulous Chinese Acrobats" will amaze us with their flexibility, dexterity, and bravery! And the lovely Ms. Kerry Lee from the Atlanta Chinese Dance Company will mesmerize us with her Chinese Ribbon Dance. The Festival will be held on Sunday, February 18th, from 3:30 – 5:30 pm in the beautiful Cox Auditorium in the Alumni Memorial Building on the campus of the University of Tennessee in Knoxville. Please join us for a wonderful cultural experience! Cox Auditorium, Univ. of Tennessee 1408 Middle Dr.